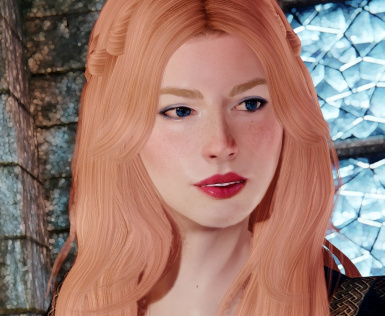 Want a curvy, strawberry blonde mage as a character ? Rose gold blonde ? Check. She likes cheesecake. So do I. Face preset + face sculpt included, body preset is a custom variant of Robton's Tiddy McButt. Please don't hesitate to endorse those gems; they deserve it ! Don't use this preset for other things than personnal use only. If you have any problem with this preset, let me know. I won't make a follower out of her; sorry. I give myself the right to delete comments from people asking about anything else but this work, especially if they didn't downloaded the mod.